These fully self-contained 1 BR Chalets are beautifully presented for guests. 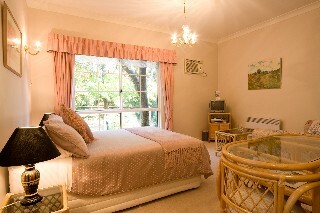 Extremely comfortable and with all the facilities you need for that extra special stay. Features include a Queen size bed, TV, CD, VCR, DVD, heating and air-conditioning and a washing machine. The kitchen has everything you need. Any couple will really appreciate the well-appointed features of this cosy open plan Chalet. With full kitchen facilities and entertainment services including DVD, TV, stereo, and CD you have all you need at your fingertips to enjoy that relaxing break. 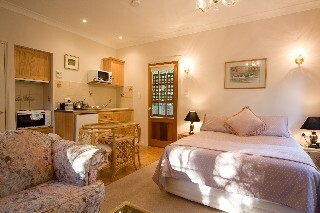 The Chalet is heated and air conditioned for your comfort and surrounded by beautiful gardens. 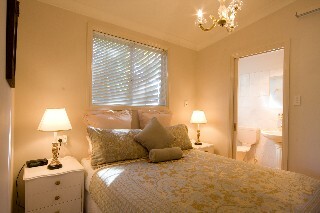 We have 2 guestrooms in our main house with King or Queen bed. 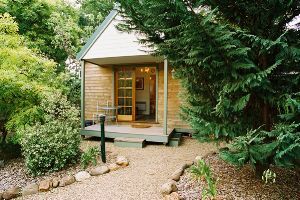 Guests have their own bedroom and bathroom but no kitchen facilities. 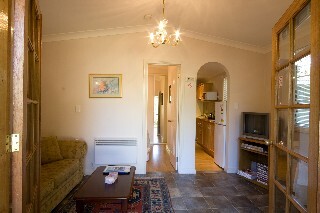 There is also a common lounge and dining room to relax in the evening and also the use of the BBQ in the garden. Tea and coffee are provided and use of crockery, cutlery and glasses in the dining room as well as microwave and refrigerator to allow guests to bring food back or reheat. 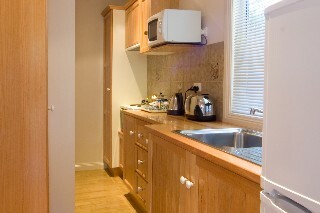 Continental breakfast is included each morning in the dining room.